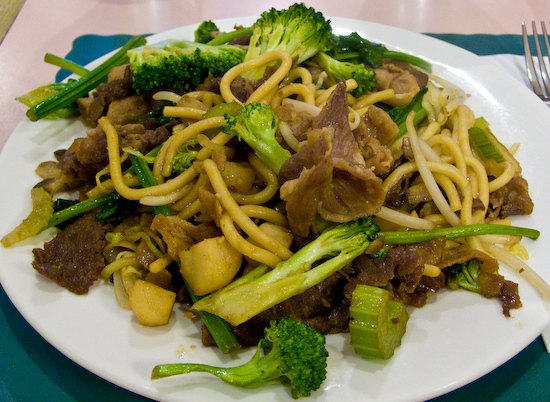 Lunch was Mongolian BBQ with Harold and Brent. For dinner, Tina and I went to a Palantir event at the Palo Alto Four Seasons Hotel. I thought it was a product demo - Tina thought it was a food event (I told her it was a free dinner and also explained a little about the company but she only remembered the free dinner part). It turned out to be a recruiting event. They did show a demo of their two products both of which were extremely interesting in compelling - had I not been already working for Fanpop and on Cooking For Engineers, Palantir would definitely be on my short list. 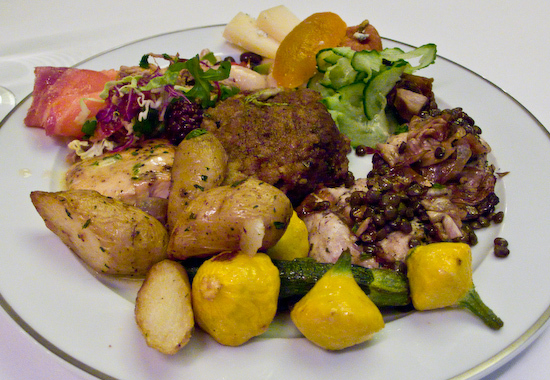 The dinner had a variety of foods set up in a buffet line including smoked salmon, blue cheese encrusted beef tenderloin medallions, chicken breast in some sort of caper sauce, salmon, pull pork salad, and other sides. The beef tenderloin was the highlight - it was tender, soft, and really flavorful. The chicken was a little tough, but had decent flavor as well. The salmon was surprisingly tender - a little overcooked but not yet tough, stringy, and gritty. 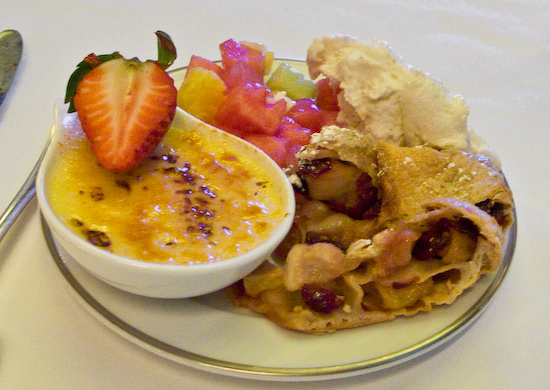 They also served dessert which was creme brulee (they apparently had two types - I only had the plain with strawberry but they also had a pistachio creme brulee on the other side that I didn't see), a dried fruit pie/pastry, vanilla ice cream, and diced fruit.